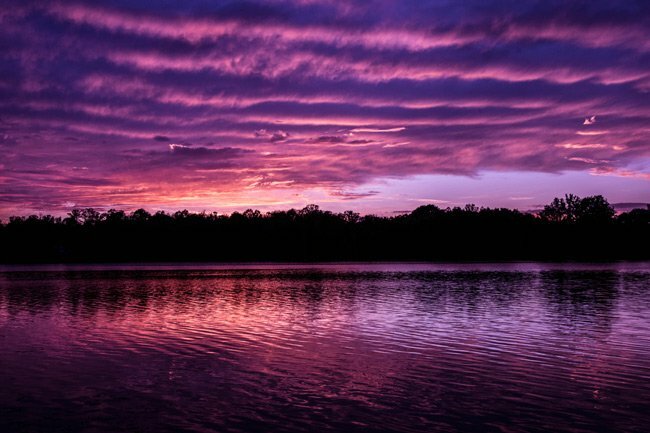 Prestwood Lake serves as a backdrop for this three-and-a-half acre park in Hartsville. The park was designed in 1938 and built between 1939 and 1941 by the WPA (Work Projects Administration), part of President Franklin Roosevelt’s New Deal. 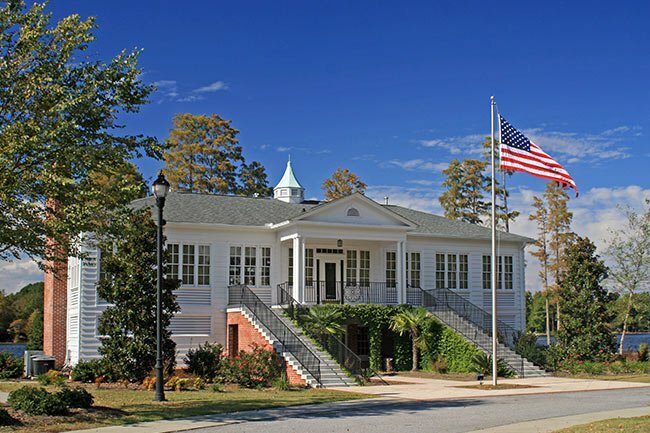 The land on which the park sits was donated to Hartsville for use as a public recreational facility by Joseph J. Lawton. The Colonial Revival pavilion seen here includes a caterer’s kitchen and is a popular event venue. Prestwood Lake itself, seen below, was created in 1896 when Black Creek was dammed for the Carolina Fiber Company – now Sonoco – paper mill. It is named for the Prestwood family who operated a ferry across the lake. A pier and boardwalk stretch into the water, and kayaks and canoes can be rented from Lawton Park, enabling visitors to enjoy fishing or paddling. Other park amenities include three tennis courts, a picnic shelter, and a playground. Both the park and pavilion were restored in 2008. Lawton Park and Lawton Park Pavilion are significant as examples of New Deal era public recreational facilities, funded by the federal government and built by the Works Progress Administration. Lawton Park, built 1939-1941, was planned as early as 1938. The park is a wooded, 3.5 acre, public recreation area including a swimming area, playground, picnic area, and tennis courts. The park includes three buildings: a pavilion, shed and keeper’s house. The keeper’s house has been extensively altered and does not contribute to the historic character of the park. 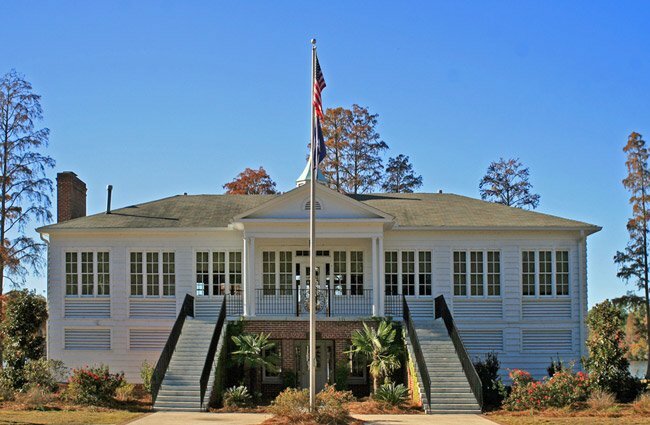 The pavilion is an excellent example of a public recreational structure showing Colonial Revival influence. It is a frame, rectangular plan, two-story building with a hip roof and cupola. Bathhouse facilities including locker rooms and showers are located on the ground floor. The second floor consists of one large open room designed for dances and community activities. All four elevations feature bands of grouped windows at the second floor. Louvered vents are located immediately below the windows and also at the first floor. The façade is characterized by a central entry portico with paired slender Tuscan columns and flanking brick stairs.